Retired IAM International President George Kourpias, center, administers the oath of office to the new IAM Executive Council and Officers. From left, General Vice Presidents Diane Babineaux, Sito Pantoja, Philip Gruber, and Lynn Tucker, Jr., General Secretary-Treasurer Robert Roach, Jr., International President R. Thomas Buffenbarger, General Vice Presidents Dave Ritchie, Robert Martinez, Jr., Gary Allen, Mark Blondin, and Dora Cervantes. 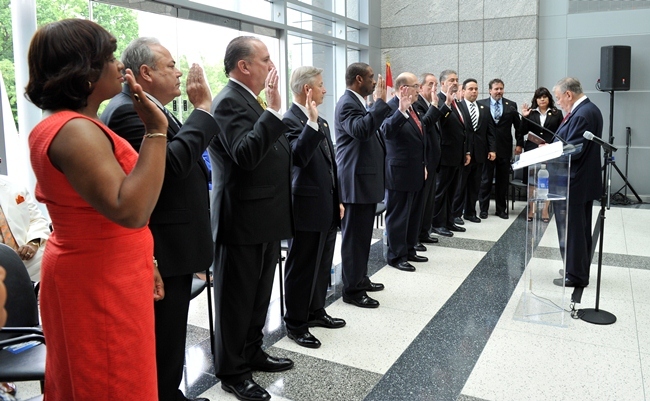 The most diverse Executive Council in the 125-year history of the IAM took their oaths of office Monday and officially assumed positions for their new terms at a ceremony at IAM Headquarters in Upper Marlboro, MD. The Council includes women for the first time – one African American and the other Hispanic – and mirrors the wide array of backgrounds seen in the 700,000 active and retired members of the IAM. The new leadership pledges swift action to help economies in the United States and Canada recover and improve lives for working families. The Executive Council, as well as members of the Law Committee and Delegates to the AFL-CIO and the Canadian Labour Congress were democratically nominated and elected by acclimation at the local lodge level. Retired IAM International President George Kourpias administered the oath of office to the new Executive Council which includes IAM International President R. Thomas Buffenbarger, General Secretary-Treasurer Robert Roach, Jr., along with General Vice Presidents Dave Ritchie, Lynn D. Tucker, Jr., Robert Martinez, Jr., Philip J. Gruber, Gary R. Allen, Sito Pantoja, Mark A. Blondin, Diane Babineaux and Dora Cervantes. Click here to watch video of the 2013 IAM Installation Ceremony.